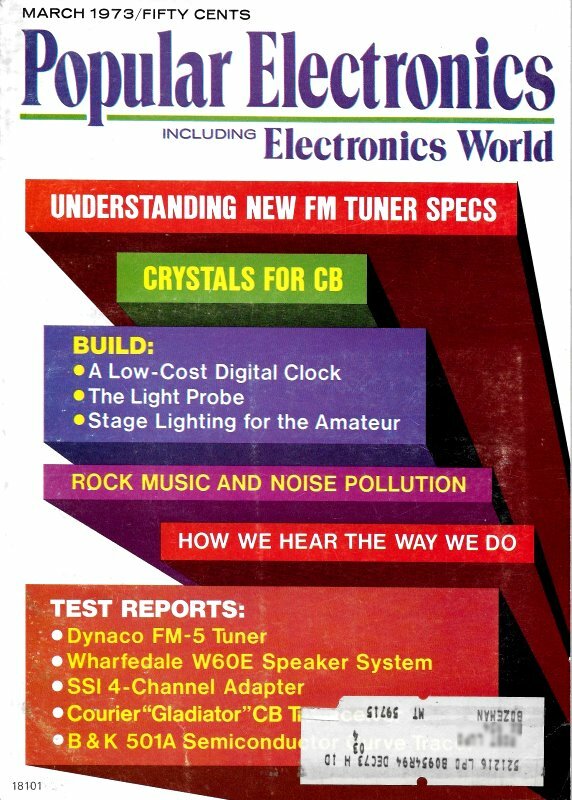 By the early 1970s, many types of vacuum tubes had already been replaced by solid state devices. A lot of the resistance by hardline lovers of glowing tubes was beginning to accept the reality of superior electrical characteristics of many types of germanium and silicon diodes and transistors over tube equivalents. During my enlistment in the USAF from 1978-1982, the vacuum tube diode used to trigger the pulse forming network for the airport surveillance radar (ASR) circuit was replaced with a plug-in solid state replacement. It seemed to work just as well. I don't recall ever having to replace the faulty vacuum tube version, so I cannot attest to whether the solid state version was an improvement. Part of the motivation for replacing tubes with solid state devices was obsolescence of the tubes, so maybe that is why it was done. The "fetrode" introduced here by Solitron Devices was designed to be a plug-in replacement for the 6AK5 vacuum tube, which is a pentode amplifier. 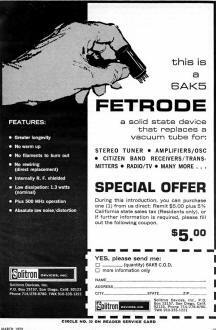 Although not specifically stated, I assume the name "fetrode" implies it was a field effect transistor (FET). During this introduction, you can purchase one (1) from us direct: Remit $5.00 plus 5% California state sales tax (Residents only), or if further information is required, please fill out the following coupon.